Autofocus by Lauren Gibaldi was quite possibly the best coming of age story that I’ve read thus far in 2016. Autofocusasks that age old question of nature vs. nurture. Does genetics shape us into who we are or is it the nurture we receive and the environment we live in? While I’m sure both have a hand in shaping our personalities, in Autofocus, Gibaldi shows us that it’s truly up to ourselves and our choices to become whomever we want to be and discover who we are. Autofocus tells the story of Maude’s journey to find out about her deceased birth mother. Being adopted, a part of her has always wondered who her mother was. With her best friend away at the college her mother attended and with her senior photography project being about family, she decides to visit her best friend and see if she can discover parts of her mother in the process. What she finds, however, may not be what she imagined. What I loved most about Autofocus was how Gibaldi juxtaposed Maude, an adopted girl wanting to see if she can discover herself through her birth mother, and Treena, the best friend from a strict family that’s trying to recreate herself. Treena wasn’t the same Treena that Maude knew before college, and it’s okay. Gibaldi created a story that showed how important our decisions are in shaping who we become. While your family may sway you one way or another, it’s truly up to you. Even Treena, a girl that knows who her parents are, is still trying to discover herself. I also loved the way Gibaldi ended Autofocus. I don’t want to say too much about it, but I did think it was perfect. The sense of closure and the bit of uncertainty that readers were left with was simply perfect. 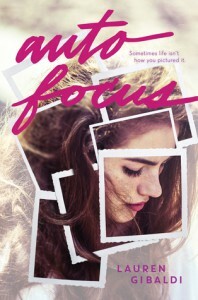 Autofocus by Lauren Gibaldi was a fantastic coming of age story. Perhaps, it strongly resonated with me a lot because I’m going through a lot of life changes right now, but truly, I think it’s perfect for everyone, especially young adults that are still uncertain with what they want to do in life. Autofocus was a lovely story about family, friendship, and discovering yourself.